We are proud to present a stunning litter of Labradoodle puppies. They are multi-generational, non - low shedding, and will range in wieghts from 45-80lbs. Please don't support mass producing kennels, your new family member deserves a better beginning than that! Ready January 6th a deposit of $150 will reserve a puppy in your name. Cash only, unless you are mailing a deposit, a reciept will be issued. We are located 35 min SW of London, 2 hrs down the 401 from Toronto...our puppies are worth the trip!!! 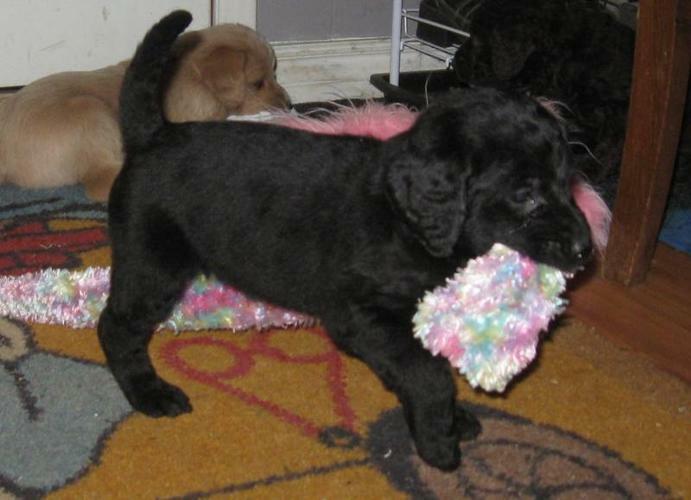 Labradoodle Black & Blond (rare chocolate features) 5 available!